My practice beliefs center on providing my patients and families with information and guidance regarding all medical, developmental, and emotional needs. I strive to be thorough yet efficient, practical, and flexible." 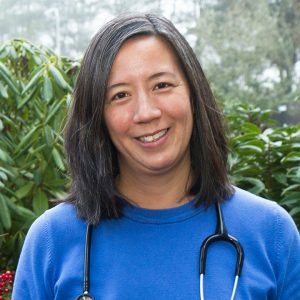 Dr. Chiu is a certified pediatrician who has practiced in Portland since 1999. She is a native of Indiana and graduated from Indiana University School of Medicine in 1995. She completed her residency at Baylor in Houston, Texas. She enjoys spending time with her 3 daughters, outdoor activities, running, and music. "Wonderful experience from the receptionist to the M.A. to the doctor. Dr Chiu listened to me as a parent and also offered advice. She was thorough but also thoughtful in her approach. I would recommend her and this clinic." "Great and wonderful place. Thank you, Dr. Chiu. I highly recommend."